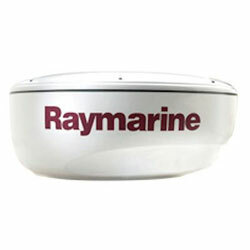 Raymarine's HD Digital radome scanner combines the power and clarity of HD Digital signal processing with an ultra-compact scanner suitable for all types of vessels. Compatible with the new c-Series, e-Series, a-Series, gS-Series (for all other systems please see note at bottom of page). These radomes offer a 256-color radar display and the clearest, most lifelike radome presentation available from any radome scanner.